Wonder why your spending so much on food lately and why prices keep going up? At Publix Super Markets, we understand that rising food prices is a major concern to you and your family. Therefore, we felt it was important to share with you our take on the situation and offer tips on how to reduce register shock. "It's way faster than DSL..." yes, there is truth in advertizing and you pay more for that speed by the way. We purchased the ultimate super charged premium service which costs about $73 dollars a month and Comcast has been improving its speed. But why pay for the premium service when someone on the $47 dollar plan is downloading faster and has the same upload speed? But that's only part of the problem recently experienced with Comcast performance and service. For some reason the download speed dropped to a little above a 56k modem one day and a speed test determined that my upload speed was faster than my download speed. Since this was the third time this had happened, I was noticeably irrate when they accused my system of being the problem. I was tired of ripping it apart but when they offered to send a tech out the next day, I agreed. The problem was not my system, not the modem, it was the Comcast circuit I was on. Without typing a book, it's now six days later and still nothing is fixed. I was told that Comcast doesn't work on weekends; that they would be out Monday (they never showed), I was told I was next in line to get service and they never called or showed up and so if you want reliable Internet service and Comcast has a problem with their circuits... you might be a long week without what they guarantee... "you should always be surfing at broadband speeds." I'm still down around 56k modem land and its been seven days. NOTE: the actual time down with the slow speed was 10 days before Comcast fixed the problem. On File: Mona Vie, vertical market scam or fountain of youth? Mona Vie - snake oil or fountain of youth? Always keep in mind that vertical/pyramid markets are extremely lucrative business opportunities with a serious downside... greed usually overwhelms common sense. We decided to try out this "miracle health drink" to see if it worked as claimed. Of course the claims are diverse and seem to depend more on what health problems you talk about with whoever is trying to hook you into the scheme. At $35 dollars a bottle we found little if any health improvement after more than six months of regular use. With that kind of inflated price tag and no health benefit, we reluctantly (we kept thinking something good would happen) decided to discontinue spending a fortune on what we think is just another drink of some sort. Perhaps the best way to view it locally, is to travel down to the Lantana Lutheran church and see the half million dollar fancy bus paid for by this vertical market scheme. Unfortunately for the more business minded folks, all the upstream profit making positions have long been filled by the "Black Diamond" group and the individuals trying to sell it to you are just looking for you to provide downstream revenue for their pockets. So buyer beware... our experience though limited, is shared by many more and by the way... if you haven't already bought your $40.00 introduction package... we have one you can buy for half that and its unopened. We were only interested in the health benefit of Mona Vie and never had any interest in hustling a vertical market scheme. Perhaps there's a reason this product never became part of health store or super market inventory. Think about it. This is a two fold problem, so let's see just what happened so you won't make the same mistake with either company. 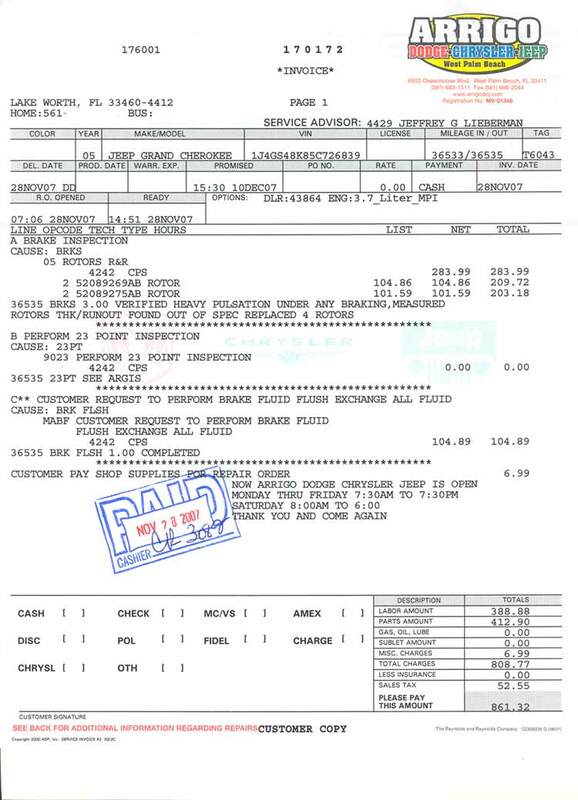 Above is the bill to replace 4 brake rotors which were "out of spec" according to Arrigo mechanics. The 2005 Jeep Grand Cherokee (26,000 miles) was purchased from CarMax in April for $20,000+. CARMAX advertizements say they check everything to make sure it's to specifications... safety systems such as brakes receiving special attention. The salesman told the customer that "the brakes are new" and even asked for the car back at one point to "touch them up a bit." But in fact, it was only the BRAKE PADS that were new. At first everything was fine but after 6 months, the car began pulsating when the brakes were applied. This was a potentially dangerous situation that reduced the effectiveness of the brakes. 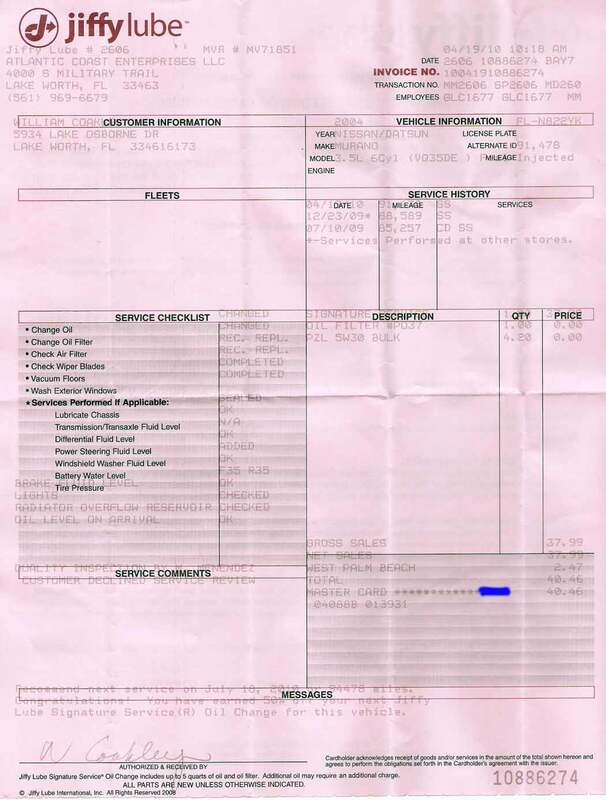 The owner had purchased an extended warranty and was certain that the problem would be fixed under warranty. Previously, the car's engine warning light had flashed and CARMAX told the owner that only a Jeep dealer (Arrigo) could deal with that problem. Turns out the warning was bogus and the dealer reset the computer. So at this point, the owner made arrangements to get the brake work done at ARRIGO... the first mistake, as you can see by the outrageous prices charged for service. It has often been said that new cars are not where dealers make money, it's on the service. But if we believe ARRIGO mechanics, the real deception came from CARMAX who failed to live up to their stated standards of thoroughly going over the car and replacing the rotors. However, it doesn't seem normal that rotors are too thin at 36,000 miles. If they were too thin, then they must have been turned at least twice which seems unlikely. Either way the owner was at risk perhaps to save a few bucks. CARMAX said they were not bound to provide any credit toward the brake job, admitting that ARRIGO DODGE/JEEP prices were well beyond reasonable. And further, they said they would have done the same job for much less. If you buy from CARMAX, beware... paying top dollar for a clean looking car might still cost you nearly a thousand dollars 6 months down the road... extended warranty or not... IF you take it to a dealer to have it serviced. Either way it appears that CARMAX missed something they should have known about. In this case, the safety of the vehicle may be limited to this one car... but maybe not. Regardless of circumstances, the brakes needed fixing and they shouldn't have. And of course, unless you want to hear that ripping sound from your wallet, don't get your car serviced at the Arrigo Stealership. If you haven't checked the price of leaving your car at PBI... check again. The rate is $12/day and short term parking $16/day. We recently took a a trip to NC and left the car for 6 days. We had no idea the fee had gone that high. When we got to the airport, it said LONG TERM PARKING FULL and we then followed the signs to the PARK AND RIDE section. That led directly to the SHORT TERM PARKING where we didn't have ten minutes to travel over to a remote parking lot and another 15 minutes to wait for a tram. So we called the Department of Airports to see if they could do something. Of course, they were delighted to insist on collecting $112 dollars for the 6 days our car was there. No mercy.